Sometimes you want to take more than just a normal photo. The Galaxy Tab has settings to allow you to take a self-portrait or a panoramic shot. Who needs to pay all that money for a mirror when you have the Galaxy Tab? Well, forget the mirror. Instead, think about taking all those self-shots without having to second-guess whether the camera is pointed at your face. To take your own mug shot, start the Camera app and touch the Switch Camera button. When you see yourself on the screen, you’re doing it properly. Smile. Click. You got it. 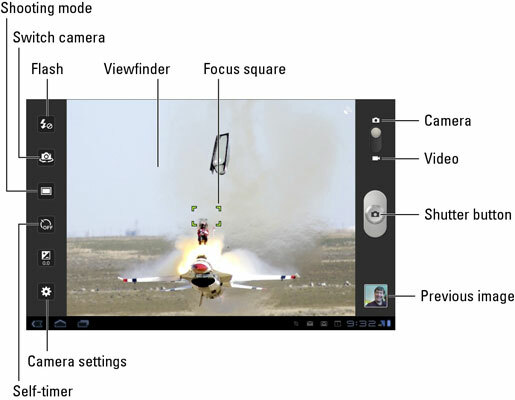 Touch the Switch Camera button again to direct the Galaxy Tab to use the main camera again. Touch the Shooting mode button. The button’s icon changes, depending on which mode you’re using. You see a green frame on the screen, which approximates the current shot. Arrows point in the eight directions in which you can pan. Pivot slightly to your right (or in whatever direction, but you must continue in the same direction). As you move the camera, the green frame adjusts to your new position. The Galaxy Tab beeps as the next image in the panorama is snapped automatically. All you need to do is keep moving. Continue pivoting as subsequent shots are taken, or touch the Shutter button again to finish the panorama. After the last image is snapped, wait while the image is assembled. The Camera app sticks the different shots together, creating a panoramic image. To exit Panoramic mode, repeat Steps 1 and 2, but in Step 3 choose Single Shot. The Galaxy Tab camera automatically captures the panoramic shot. You touch the Shutter button only when you’re done.